This is one durable and accurate Multimeter for the HVAC pro and electrician. It is a True RMS device – so will appeal to those in industry with variable AC drives – as well as for general purpose amateurs with its auto ranging and attractive price. 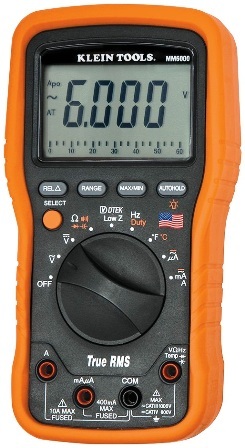 The Klein Tools MM6000 is packed with features, including temperature input, low impedance mode and an auto hold, and it has one of the nicest displays of any meter we’ve reviewed. In addition, it is drop tested to 10 feet and is made in the USA. The MM6000 has a good selection of measurement criteria, including voltage to 1000V, all current ranges (with micro-amps), plus good capacitance and resistance ranges. Temperature can be displayed in Fahrenheit or Celsius and a thermocouple is provided. While not as fast reacting as a typical Fluke multimeter, both continuity and capacitance are surprisingly quick. Accuracy is also very impressive, with a basic DC voltage accuracy of 0.2% and acceptable levels on high AC amperage. Low impedance mode (LoZ): Electricians use this for ascertaining the presence of voltage in a cable loom or conduit. The low impedance setting effectively dissipates any ghost voltage induced by nearby live cores in a ‘dead’ cable (the one currently being checked). Micro-amps (µA): One for the HVAC technician, allowing for the testing of flame sensors. Modes: Max/Min is a nice touch as it lets you take a snapshot of the highest and lowest values when measuring a reading on a changing signal. While fairly typical on high priced meters, it is not always a given. Also included is a relative mode, for comparing values of a previous reading. This also doubles as a zeroing facility. Auto ranging is activated by default on the MM6000, so simply select a range and go. The RANGE button allows you to change to manual mode and then step through individual ranges. This can be better for those who know what they’re doing and may increase response time. The Klein MM6000 is a sturdy, ergonomic device with an easy-to-grip body and strong protective holster. The removable holster has a kickstand and probe holders built in. Drop tested to 3m (~10ft), it is double insulated and also boasts an easy to open battery and fuse compartment. A single screw into a nutsert provides access. Klein Tools is a US company. Certain parts and components might be brought in from overseas, but the MM6000 is indeed put together in the States. It has a beautiful screen, perhaps the nicest out there for this price range, almost on par with an LED. It is a 3 5/6-digit, 6000-count effort with rapid bar graph and a bright backlight. The backlight is especially useful as it stays on for around two minutes at a time – some cheaper meters only stay on for a few seconds in comparison. Sampling rate of the display is three times per second, so you get a fairly quick updating reading of fast changing values. To monitor this more precisely, the bar graph updates around 10x as fast and also auto ranges along with the main display. Battery: as it is driven by just the two AAAs, battery life is not all that great on the Klein Tools MM6000. It is rated to 160 hours, though you’ll likely get less than that if you use the backlight a lot. There is an auto power-down function to help save the battery, which engages when not used for 30 minutes. A low battery indicator shows itself when the batteries are running low. Also on the MM6000 is a lead warning function, which alerts when the probes are plugged into the wrong jack input based on the present dial position. Current protection is via two large HRC fuses that are totally isolated from the circuit, which protects the meter in the unlikely event of an explosion. The low current input is protected by a 440mA fuse and the high current side an 11A fuse. Both are rated 1000V to ground and are fast blow. The category rating is IV at 600V and III at 1000V. It can thus be used to measure up to three phase systems outside and can safely handle surges up to 8kV. The MM5000 measures fewer ranges. There is no current, frequency or capacitance range and it also does without a temperature input. There is a low impedance mode, however, and AC and DC voltage retain separate dial positions. The MM5000 also omits a relative mode and is not as accurate as the MM6000. The Klein Tools MM6000 review details a very sturdy and accurate multimeter fit for HVAC work or industry. A highly functional device, it comes with features including temperature, micro-amps, relative mode and low impedance mode, and has an excellent screen. Highly rated on big e-commerce sites like Amazon, it is also very accurate and makes a good alternative to those who cannot afford a top end meter, or for amateurs wanting something better without breaking the bank. Alternative: The Amprobe AM-570 is a good alternative. Built by another US company, it also has micro-amps, low impedance and a temperature input.